Around midnight last night there was a brief thunderstorm with thunder and rain. It’s almost a full moon, and it was quite bright once the storm passed. I started my period this morning and was feeling lethargic, so I slept in and caught up on blogging. Since I got the hitch to the trailhead so quickly, I actually have an extra day to hike. 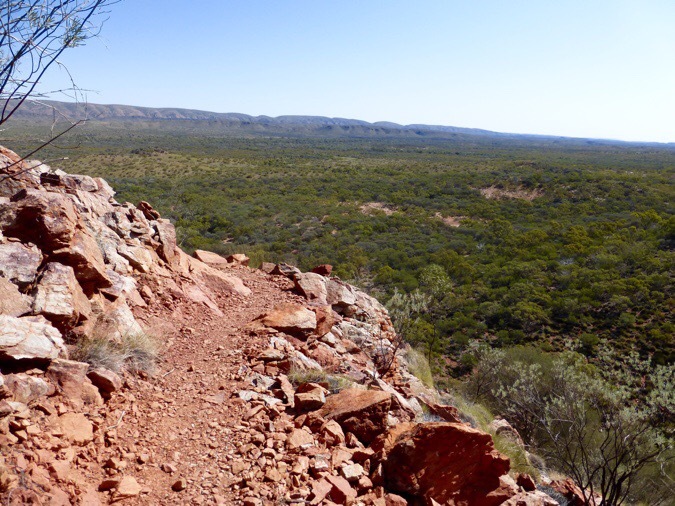 There’s no sense in spending two nights in Alice Springs, so I get to relax a bit and hike a few less miles each day or include some bonus side trips if I like. 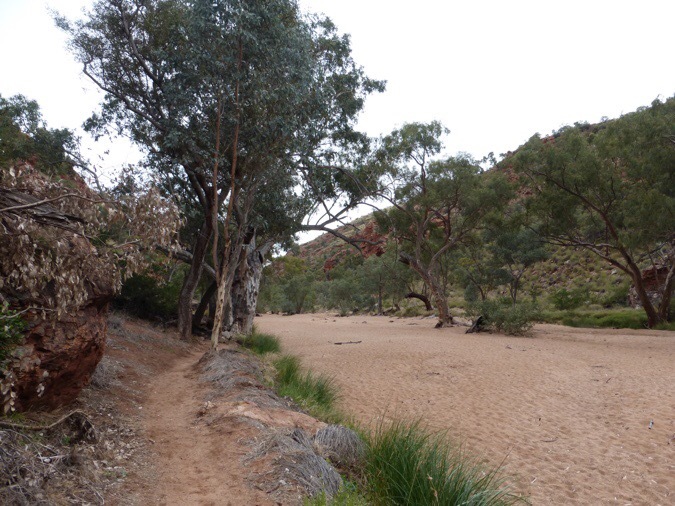 Before I packed up the tent, I did a short 1.6mi/2.6km round trip from camp to see Redbank Gorge. It was just down the wash that I was camped in. Most of it was sand, but it got rocky at the end to the point that I could see the actual gorge. People who don’t mind getting wet can hike back even further into the gorge a bit. 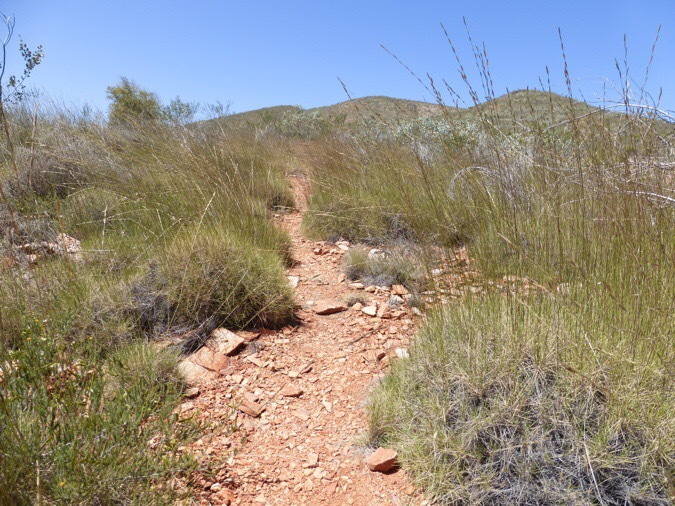 Most of the hiking today was on flat terrain with an easy to follow meandering path. The path is very well signed, and at times, I can see the blazed metal signs even two ahead. This trail was obviously made to increase tourism in the area, and much is set up to encourage walking. The water tanks aren’t too far from one another, so I can usually just carry a liter of water between each one. 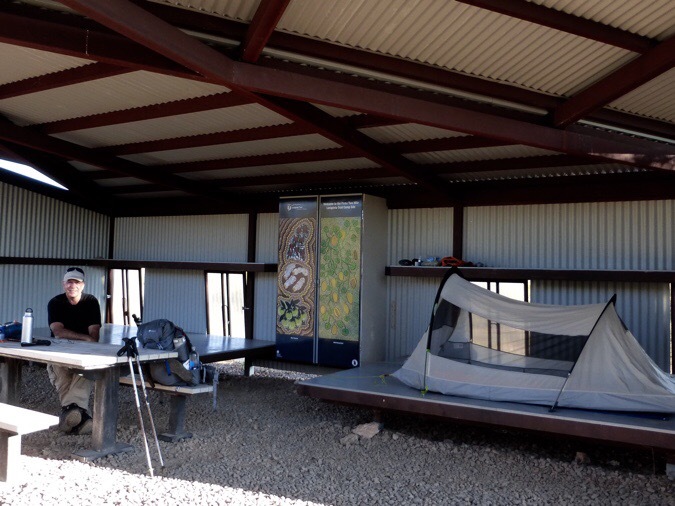 There is camping at each tank, a toilet, and even 6 nice shelters along the way. Everything looks quite new. 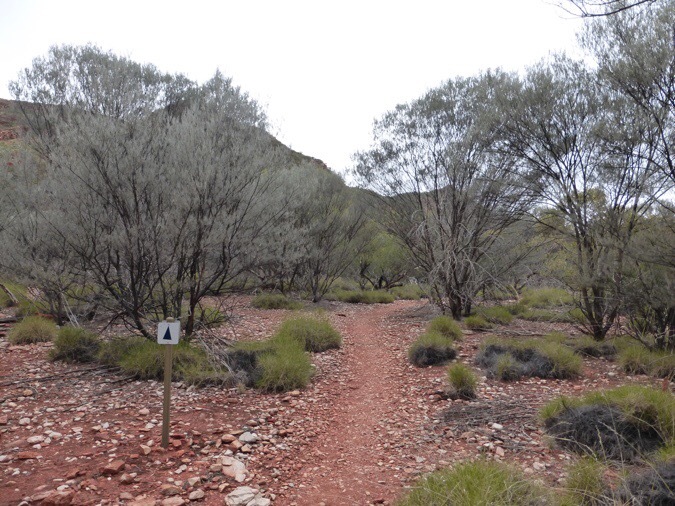 The Larapinta became a trail in 2002 after 12yrs of work to create 12 sections. With how rocky it is out here at times, I can imagine it took quite a lot to get a path made in some areas. 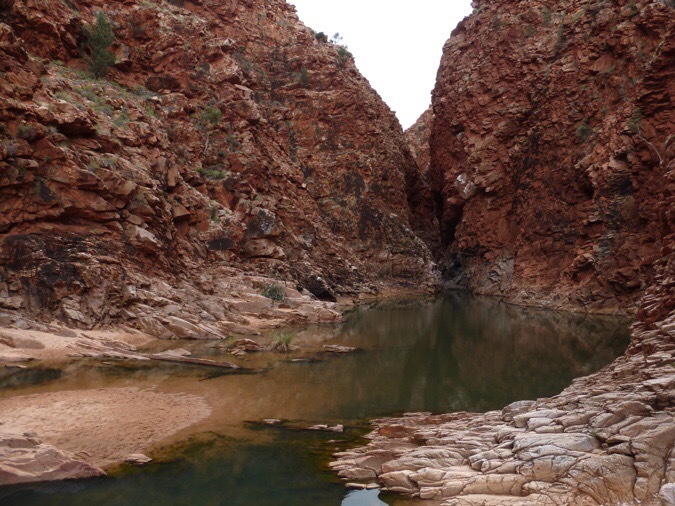 The trail is named after the Aboriginal name of the Finke River, which supplies the water for this area, and is one of the oldest rivers in the world at 350 million years. 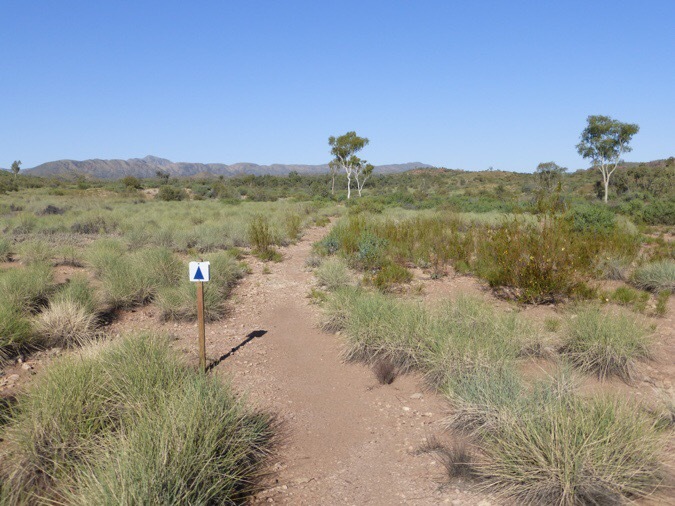 Each section has an access trail from a parking area and this encourages section hikes of part of the trail or even point to point day hikes from one access point to another. Also, there are secure areas that food drops can be done by a company if people need. 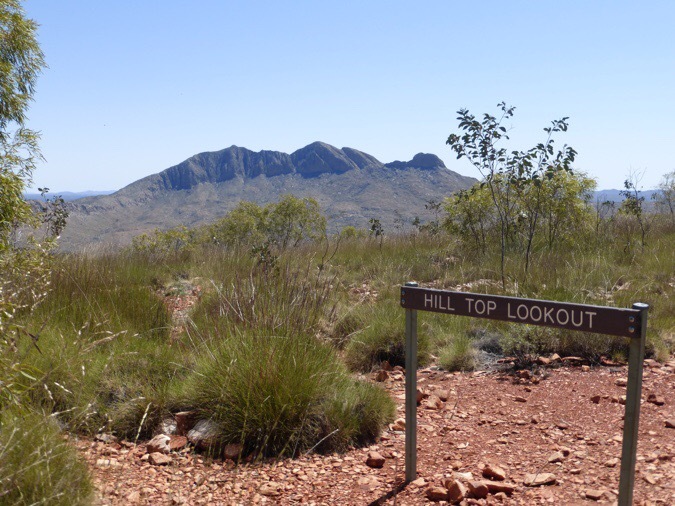 It’s recommended to take at least 12 days to do the hike and most end to enders cache. My pack has 7.5 more days of food in it. Walking that flat trail this morning, with little to distract me, and a lethargic body was not the most enjoyable way to kick things off. After a couple hours, my body accepted that things were not going to change and the weight became the new normal. 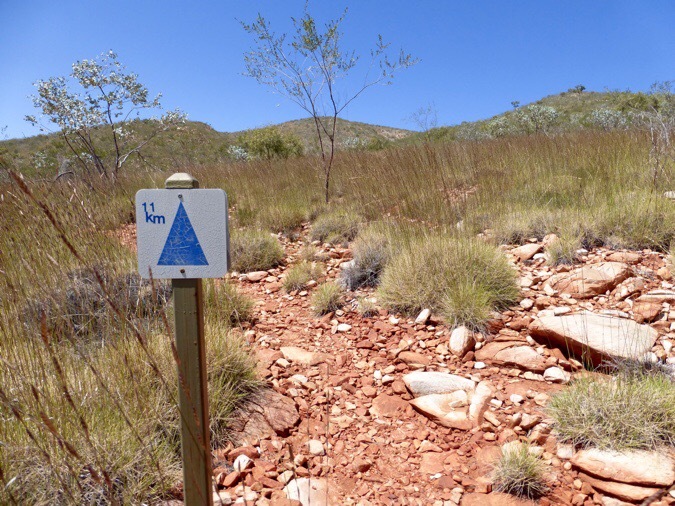 Signs even say how many km you’ve gone in a section. It was cool out this morning, but by late morning, all the clouds had disappeared and that big blue sky that I envisioned appeared for the first time since I’ve been here. I miss the clouds, but I know they are forecasted to return this week. The next few days will be warmer. I did finally figure out what I may have left in the US and forgot to pack. We knew it would be something of course. At least it’s nothing essential. I don’t seem to have my keychain thermometer. I switched to a new pack Gossamer Gear gave me before I left and I thought I took the keychain off the old pack and put it in the zipper pocket while I was traveling. There is a chance that it’s in the duffel bag I left at the hostel with extra supplies I’ll need over the next 7 months. I was so close to perfect on not missing anything! I started a new audiobook this morning that’s just right for what I’m doing. It’s Bill Bryson’s “In A Sunburned Country” about his travels in Australia. It was a good distraction from my overall discomfort. I only saw two other pairs of hikers while walking today. One couple doing a section opposite direction from me, and a pair of guys in their 50s who had also camped with me were at the first water stop around 11:15am. They planned to camp just an hour up the trail further. They don’t have time to do the whole trail, but are doing more than half. 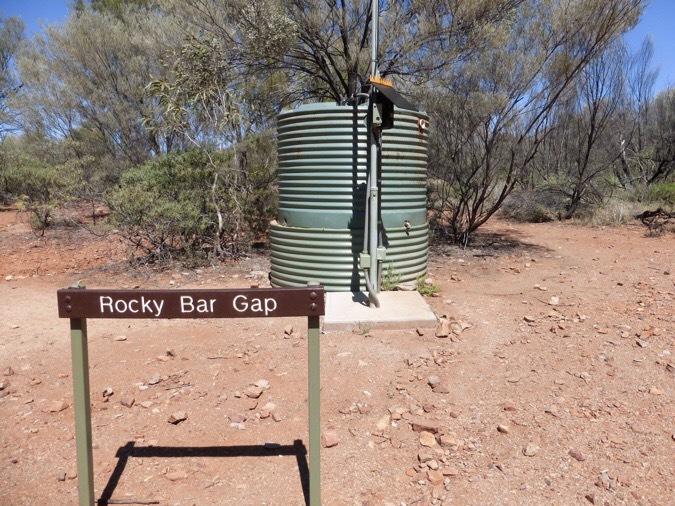 I was shocked that they were going to take the day to lounge at the campsite at Rocky Bar Gap before making the short hike to a viewpoint for their camp for the day. I asked them why they didn’t just go further as they were easily keeping the same pace as me and probably had time to do the whole trail if they wanted. 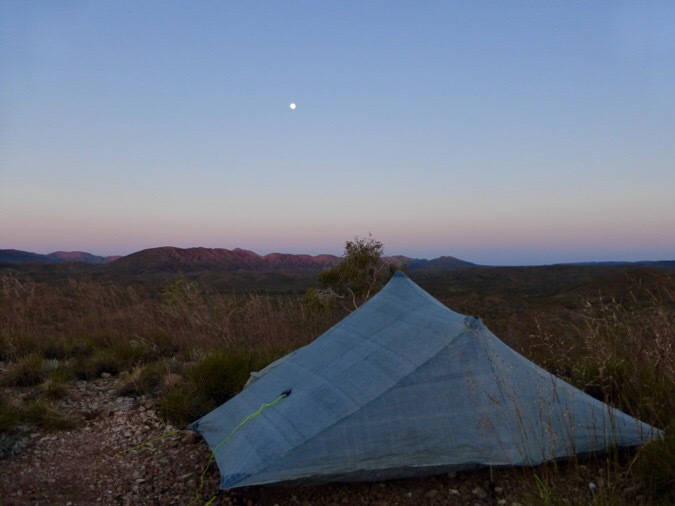 They had an interesting response about it being the Australian way to do less trekking and more just being out in the wilderness. They said it all looks the same (which I hope isn’t true), so there isn’t much more they would see by walking than by sitting down and looking around. I heard that I’d be in the minority out here and in NZ as generally, international walkers are said to enjoy doing far fewer miles each day than Americans, who seem to have a more goal oriented mindset. My theory is a bit different. I think part of it is that we are accustomed to miles rather than kilometers. It sounds pretty cool to say you’ve done 10km, but that’s just 6mi. Maybe the American mentality is different because our base unit of measurement is larger. 1mi=.6km. I plan to do about 29km/day out here, which sounds huge, but that’s actually just 18mi, which seems like a lot less even though it’s exactly the same distance. That’s just my personal theory. I apply the same theory to temperature. American degrees are more finite from one digit to the next in Fahrenheit than in Celcius, since one degree Celcius is just under two degrees Fahrenheit. I feel like that makes me more sensitive to the small changes in temperature because I have something that concretely labels it more precisely. Again, just a personal theory and where my brain runs as I hike. There were lots of different flowers out today, so I tried to get shots of them. The bright sunlight made it a bit difficult to get clear shots, but you get the point. 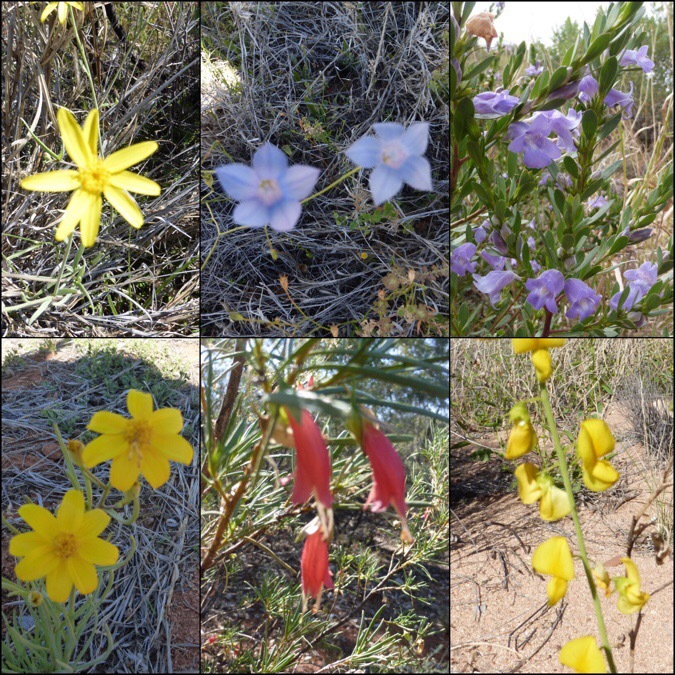 Many are actually labeled in the Larapinta guidebook I have. 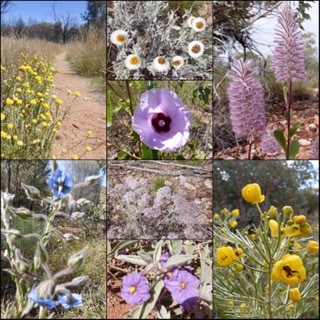 The guide points out, that over history 600 species of flowers have developed in this area due to the burning of the land Aboriginals would do to maintain the land and keep it from growing too much. Because of this, new plants would grow and most of the plants out here are fire resistant. I did hear more birdsong in the morning hours, but thankfully none overnight. It was tough to spot the birds as they seemed to be coming from a good distance away. I did get one photo of a unique one. I had a long lunch up at a viewpoint where I got service and was able to post yesterday’s blog and call my sister to check in. I am eating peanut butter on tortillas with string cheese for lunch this trip because I couldn’t find my regular tuna in foil packaging. It’s gonna be tough to get that peanut butter down each day and I hope to find tuna packets for the Bibbulmun. I only gagged once today trying to swallow the peanut butter, so that’s pretty good for me! Looking back on Mt Sonder. The sun was hotter after lunch. It seemed to be around the upper 70s today (25C). I was very happy to have my umbrella to shade me! I wanted to wear shorts, but there was enough unfriendly brush to keep the pant legs on. Spinifex is everywhere. It looks like grass, but feels like a cactus. There is also tall grass growing out of it like wheat that is shoulder high and even bothers my arms when it rubs on them sometimes like fiberglass it seems, but that might just be my skin that tends to be sensitive. The evening sunlight after 4pm was great to walk in. It was quite quiet in the afternoon and just very relaxing. Today was one of the more relaxing days out here. It does get rougher and isn’t all a meandering nice path. This trail is quite rocky in parts and will be more challenging, but this was a nice warm up. 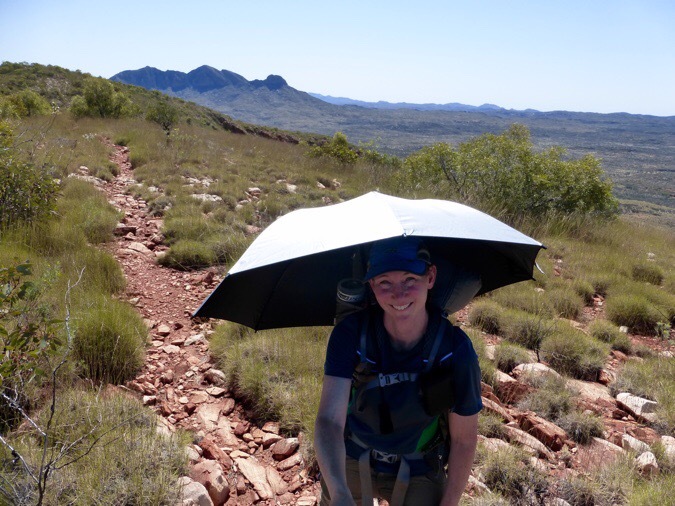 At the last water tank, at the Finke River campsite and shelter, I met another hiker. His name was Peter from NZ. He hurt his ankle and is getting off trail tomorrow unfortunately. He lives right near the trail in NZ, so I may see him again. He and his wife have a small winery that has an extra apartment outside of Wellington I could stay in if I like, but I have a friend in Wellington I hope to be staying with if timing works out. People out here are really nice! 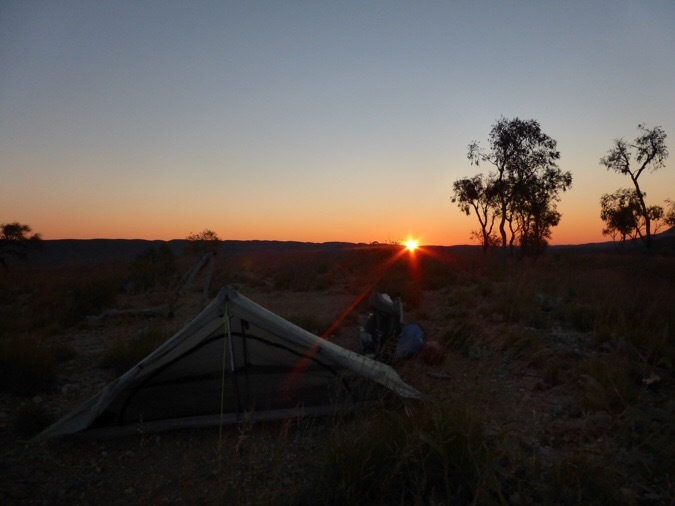 Peter at the Finke River Shelter. Notice how new the shelters are. I’m used to wooden three sided shelters with mice crawling all over. These are really nice and there are six of them along the trail. I continued on another hour to be able to camp up high on a viewpoint. I got to see a great sunset that photos were not doing justice. Also, it’s a full moon! It’s so bright that I don’t even need light to read my guidebook. It’s pretty grand to be up here and have this space all to myself. There is a different feel to the center of Australia I feel. There is just so much space. It feels really large yet calming in an interesting way with how flat it is. It’s just really cool to look out over all of it and have a red horizon on one side and a bluish purple horizon on the other with a full moon. Today was a relaxing day and I’m soaking it up all I can. Sunrise tomorrow will be great! I heard tomorrow’s scenery is pretty great too. Love your theory about the units of measurement. Agreed! Interesting comparison between km & mileage. Either way, I tend to get a little board if I quit to early and after I get broken in I can soak it all in even while I’m hiking. Comes down to preference I guess. I was up in the Sierra for a week in late August and heard your named referenced at least 5 times out on the trail. Your getting very well known out there for the short time you’ve been doing this. I may just need your autograph if we ever cross trails. As always, Enjoy your hike and be safe. Oh cool! It’s just as much fun for me as it is for others to see what unfolds out on these trips. I see it like a tv series at a new location each season and a new set of characters with some reoccurring ones at times. I like to think that people can look at it like a series and talk about their favorite season, characters, and episodes! I did peanut butter on my tortillas on this last trip and I sprinkled dried cranberries in the peanut butter which made it easier to eat. Great discussion on units of measure! I’d love to hike where you are. Looks just my speed. 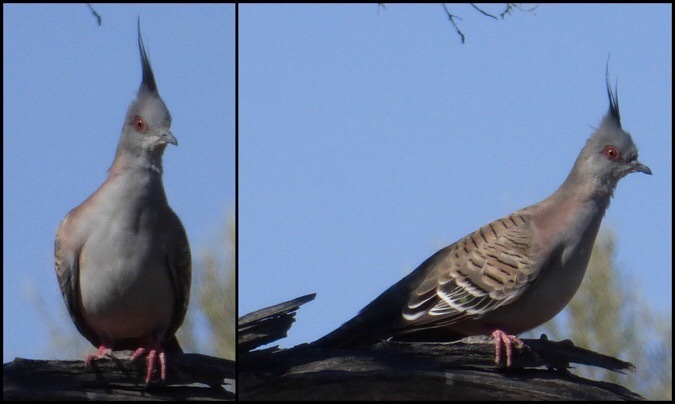 Your bird in this hike is a Crested Pigeon. It is beautiful. Thanks for all the photos of the flowers. As I age I find I enjoy looking at the flowers more and more. I’m doing my best to pay closer attention to the birds and flowers. 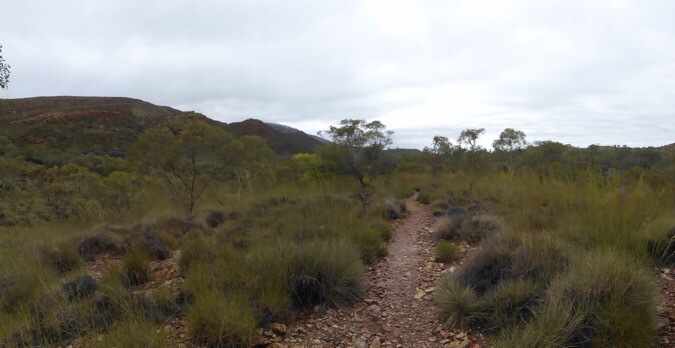 Yes I find the Australian outback has a very calming feel. The continent feels so old and just there, which it is. That’s why there are no particularly high mountains in Australia. It’s been so long since we’ve had much in the way of active volcanoes to grow the landscape and the mountains have mostly weathered away. I once lived outside Australia for 3 years straight and missed the land more than anything else. re your tuna pieces, I haven’t seen them, but 100 gm sachets of salmon pieces are available from woolworths supermarkets – don’t know about in small towns, but certainly in the major centres. You will find them amongst all the cans of fish. am really enjoying your posts. I’m giving the salmon packets a try, but they are flavored. I better take to it cause I have purchased them for 2/3 of the Bibbulmun’s lunches. It has to be better than the pb, which killed my appetite. I enjoy reading your posts! One correction on this one: Celsius goes from 0 to 100 (100 C degrees), freezing to boiling, Fahrenheit 32 to 212 (180 F degrees). 180/100 = 1.8, not “over 2 degrees”. Ah, fixing that now. I think I meant to just say 2 degrees as an estimate. That is one of my favorite Bill Bryson books!! I’ve read all his travel books, and “Sunburned Country” and “A Walk in the Woods” are my two faves. Have you read “Tracks” by Robyn Davidson? It’s a really excellent true story about a woman walking 1500 miles through the outback with four camels and a dog; it’s very meditative and powerful. There was a good movie adaptation made several years ago starring Mia Wasikowska (available on Netflix, if you are able to watch). “The new normal” has become a much-used term after hearing you say it when you were in Big Sur. Love it! The sunrise, sunset, and flowers are brilliant! The “bluish purple horizon” you saw opposite the sunset is the shadow cast by the earth, which darkens the atmosphere to the east. … and the reddish/pink layer just above the purple shadow in your evening photo above is light reflecting back to you from molecules high enough above the horizon to see the sun that’s just below your view to the west. For a little more astronomical fun in your super-dark skies down under, after nightfall (but before midnight) pick out a satellite orbiting from west to east. It will vanish from sight the moment it crosses into the earth’s shadow at its orbital height.